Four generations of people with BPES: Grant, with daughter Caitlyn, grandson Oscar, and father Kevin. Below is the first in a series of BPES Biographies. Meet Grant Muller from the Fraser Coast region of Queensland Australia who is the Administrator of the largest BPES facebook group. I’m excited he’s sharing his personal experience as well as coming from a family with many who have BPES. Thank you Grant! Hi all, my name is Grant, and I have BPES. My father also has it and he was one child of five who has visible signs of it. Both my brother and myself have BPES, my brother has two boys, the eldest who has BPES and my wife and I have two daughters, the eldest who has BPES. This daughter, Caitlyn and her husband Adam now also have a son, Oscar who has BPES. The fact that I have BPES has never formed part of who I see myself as nor have I let it dictate my life greatly and have always led my life and behaviour on the basis that I am judged on my performance and integrity not on my appearance. But I do know that I have to perform at a higher level than other people and prove myself to get people to look past the BPES aspect of my life, this is part of human nature for most people and I have had to throughout my career ensure I project my ability to ensure I am judged on ability not on looks. To give you all a further background of my myself, I am from a farming family and my schooling years were the time in my life where it was most trying with a steady succession of being bullied and picked on until I learnt first of all how not to be a victim then secondly how to stand up for yourself. Looking back on these years I think without this period I would not have become the person I am today and the life lessons learnt have held me in good stead through the rest of my life. ​After I finished school and went through a progression of short term jobs then got a job at the local sawmill as a general labourer and proved myself through effort and accomplishments to progress to an area manager of the mill. I then had the opportunity to progress my studies which led me to be the management accountant for the company. I have now established myself as a senior leader within the company and lead a wonderful life. I have always aimed at ensuring that in everything I do I excel and my extended family is a living example of this. I met my wife Wendy when we were fifteen and we were married at nineteen, three years later we had our first child, Caitlyn, then two years after this our second, Tamara. Caitlyn is now twenty-five with a husband, Adam and a young son, Oscar. Having a condition such as BPES doesn’t define you as a person but it does influence the choices you make and the way you interact with other people, I have found throughout my life that when meeting someone new there is often that small glance that people give when they see something different. I am now usually very forward with comments and discussions I have with people about BPES and find that once people are aware of the condition it seems to stop the sideways glances they seem to give. Having to deal with peoples glances and comments about kids is harder and while I can accept comments from other children to an extent, the comments from other parents is harder to accept. There have been times when my kids were young where I didn’t handle this very well, now I am a granddad and maybe mellowed a bit I find I look at these as opportunities to educate people or other kids though this can be really hard to do sometimes. I don’t know if there is a right or wrong way to talk to people about BPES but when I get the opportunity I do try to do this in a positive way. All you can do is reinforce to your children/grandchildren that BPES doesn’t control your life and while you may have to try harder than other people, you know that you are judged on your achievements not any other factors. Grant's family: Caitlyn Nicol (Muller), Adam Nicol, Wendy Muller, Oscar Nicol, Grant Muller. *If you would like to share your story on this blog please contact us! As a parent of a child with BPES, I strive to be her number 1 advocate. As we get ready for kids to start the new school year, I've thought about what I want to tell her teacher. With some feedback from a few parents of kids with BPES, this is what I've come up with. Please comment with other ideas or feedback! I’m happy you’re here to better understand one of your students who has BPES (Blepharophimosis Ptosis Epicanthus Syndrome). I am a parent of a child with BPES and a teacher myself, and I’d love to share a few things about your student. And as you know, every person brings their own unique experiences, perspectives, and expectations. So, please continue to the amazing work you do to meet the many unique needs of your likely oversized classroom. You can certainly peruse this website to learn more, but the gist of it is, this is a genetic syndrome that may or may not have been passed on by parents. People with BPES generally go to a specialized ophthalmologist once or twice a year. Some have surgery as young as at 6 months of age to open their eyelids wider, but some don’t do any surgery. Some people have a vision prescription, but many also have perfect eye sight. Some come from families with dozens of people with BPES, and some, like me, are learning about it the first time with the birth of their child with these special eyes. First, it’s important you know that there is no correlation of mental ability or lack there of with this syndrome. People with BPES have a unique appearance and may have a smaller field of vision, but they are creative, smart, and capable. If they have a learning difference please treat them as any other child to provide accommodations and service. Please do not assume that your student with BPES can’t see or needs to sit in the front of the room. Just like any child, this one may or may not have a prescription. If they wear glasses, they may need your support in not losing them! Some people with BPES have sensitivity to light and may wear sunglasses or a hat on the playground. These kids and their families are used to people’s curiosity and by they time they get to school; they likely have a stock answer like “I have special little eyelids and can see just fine, let’s go play” or “no, I’m not blind, I have BPES” or “no, I’m not sleepy, God gave me smaller eyelids,” etc. However, the journey of a child to understand oneself, this difference, and how to navigate social challenges that emerge in schools is something each family is likely working on and may want your help if their child is struggling. The fact that you’re reading this shows that you are a stand out educator who cares about each of your students. You likely worked a bit over the summer and it’s likely the weekend right now as you put in the extra time to create a healthy learning environment for your classroom. Kids & teens Self portrait contest! Summer’s here and kids may have extra time on their hands! Let’s celebrate these beautiful eyes with a self portrait contest! Any 2D medium is acceptable for kids and teens up to 18 years old. Submissions are due 8/1/2017 to contact@bpesfoundation.org (contact this email for mailing address if you can't scan your image). Voting will take place in bpes facebook groups in August. This is part 2 of a two part story. Read part 1 here. My husband and I have two girls with BPES. Our oldest, Amelia, had her first eye surgery (canthoplasty) when she was three and her second surgery (external levator resection) when she was four. This procedure was recommended by another mom in one of the BPES groups and when we met our doctor, that was the approach he recommended as well. He said that she had quite a bit of muscle in her forehead that would work well for the sling surgery, but he felt that with her current eyelid opening, external levator resection was the best way to go. Leading up to this surgery was different in various ways as it was not her first surgery and we did not have concerns with how she handled anesthesia, etc. She also was aware she was having surgery and talked about it frequently before the day of the surgery. Although, there are advantages of already experiencing surgery with your child, there are also disadvantages. We knew how hard it would be when we had to part ways with Amelia prior to surgery. We also knew how tough the recovery room would be, and these thoughts led to anxiety for us as parents. We talked to Amelia and offered her many options to ask questions or raise any concerns she may have had. She didn’t have any questions; she knew the doctor was going to paint her eyes to help her see better. This surgery was, thankfully, scheduled first thing in the morning. She didn’t have nearly as much time playing in the playroom like before as we didn’t have any delays; she wasn’t happy about this. When we went back with the nurse to get her changed and ready for surgery, she started to get nervous because she remembered this part. Her surgeon came in and she reminded him he would paint her eyes. When he marked her eyes for surgery he drew a tulip above one eye and a daisy above the other and showed her it in a mirror; she was pleased. She made sure to tell the anesthesiologist that she threw up at her last surgery and did not want to throw up again. He told her he would do his best to make sure she did not get sick. When it was time to part ways with her; she cried and was very upset. This was very hard for us, but we knew it was necessary. This surgery took a little less than an hour and everything went well. We were in the recovery room with her within ten minutes of her arriving. This recovery room experience was much harder than the one we had the previous year. The fact that she was a year older made it much more difficult as she was more aware of what was going on. When we walked into the recovery room we could hear her yelling. I sat in the bed with her and held her as she was waking up. She continually complained that her “watch” was hurting her hand and wanted it taken off. Her IV was in her hand and it was causing her discomfort. After this going on for approximately ten minutes, her nurse asked if we thought the IV was causing more discomfort than her eyes, we agreed that it was and asked that it be removed. They were attempting to leave the IV in place in case she needed more pain medicine. The surgeon had already prescribed an oral pain medicine she could also take so we decided to take the IV out to limit her aggravation. She was much more combative this time when she was waking from anesthesia, which can be attributed to the fact that she was a year older. Once the IV was removed and they gave her a dose of pain medicine, we were able to go home. When we came home, Amelia said she couldn’t open her eyes. I’m pretty sure her eyes felt different to her and she was afraid it may hurt when she opened them. Once she was settled at home with her daddy, I went to pick up her pain medicine from the pharmacy. While I was there, I went to the toy section to see if I could find something she could enjoy with her eyes closed. I found a container of FLARP, which is a noise putty that makes silly noises when you put your hands in it. I thought even if she won’t open her eyes, she can feel the cool, gooey, texture and hear the funny sounds. Within a minute of giving it to her she opened her eyes and had a great time with her new toy. After this, she was pretty close to being back to her normal self. I had her sleep in my bed the night of surgery, just so I could make sure she was ok. The recovery period from external levator resection surgery was even less than the recovery from the canthoplasty surgery she had a year prior. She has healed wonderfully and we are all very happy with her results. We are now preparing for our youngest daughter, Eleanor’s surgery in summer 2017. It will not be easy preparing for Eleanor’s first surgery as we will still have all the fear and anxiety leading up to the surgery date, but, at least, we know what to expect in the healing process. ​Children are incredibly resilient and will amaze you with their strength. As a parent, I would recommend making sure you communicate what is going to happen at a level your child can understand and allow them the opportunity to ask questions. Attempt to make this experience as normal as you can for your child. Amelia understood what was going to occur on her level and it really helped with both of her surgeries. If you are reading this, most likely, you either have a child that may need surgery or has already had surgery. I know the emotions can be really overwhelming, as they have been for us. In the end you have to make the best decision for your child and hold it together long enough to get through it. They will pick up on your anxiety and it could cause unnecessary stress for them. If they see mommy, daddy, or anyone else close to them crying, upset, etc. about the surgery, they will also be concerned. My greatest piece of advice is to keep the whole idea of surgery as normal as possible and explain things on their level. Hugs and love to all the moms and dads either considering or preparing for surgery. Read Part 1 of this post about Amelia's first surgery here. Written by Cyndy Somerset, whose husband and two children have BPES. Cyndy with her two children. My husband and I have two girls with BPES. 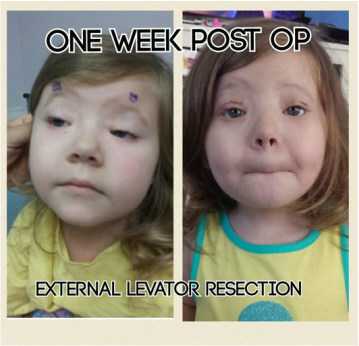 Our oldest, Amelia had her first eye surgery (canthoplasty) in August 2015, when she was three and her second surgery (external levator resection) when she was four. Prior to her surgery, my husband and I were very nervous as any parents would be. We kept ourselves together in front of Amelia, but had to take turns breaking down to make sure she did not see us upset. We did not want her to think there was anything to worry about. I knew we needed to discuss the surgery with Amelia, but I wasn’t sure of the correct timing or even how to do it. The morning of her surgery, we reminded her that she couldn’t eat or drink and she honestly didn’t have an issue with it. Her surgery was unfortunately one of the later surgeries at the local children’s hospital. When we arrived at the hospital, she was very excited to play with all the neat toys that were available in the waiting rooms. As with many surgeries later in the day, her surgery time was bumped back several times; which, of course, only made mommy and daddy’s nerves worse. Amelia, on the other hand, was completely happy to have extra time to play. When it was almost time for surgery, we went back with a nurse and she got to pick out what she would like to smell (laughing gas); she chose strawberry. When it was time for her to go back, the nurse she met earlier and the anesthesiologist met us and she walked with them down the hall to get ready for surgery. We hugged and kissed her and told her we would see her soon. Of course, this was one of the hardest parts of the day. My husband and I completely lost it after she could no longer see us. Her surgery took longer than planned, but given the nature of the surgery we would prefer the surgeon take his time to ensure everything is perfect. When her surgery was finished, the doctor came out and explained that everything went well and they would be taking Amelia to the recovery area. Within ten minutes of Amelia being in the recovery room, we were able to be in there with her. This was a very hard part of our day as I don’t think it is possible to be prepared to see your child with stitches in their eyelids. In the recovery room when she cried it looked as if she was crying blood, and we weren’t prepared for this. It was rough, but only temporary. She was very disoriented and nauseated after surgery. My husband and I exchanged many glances that communicated “why on earth did we do this?” This was the hardest part of the entire surgery, and thankfully, Amelia has very little memory of it. She remembers that she threw up, but that’s it. She was in the recovery room for about an hour and a half as they had to get her nausea under control before we could take her home. She slept the car ride home and stayed asleep the entire night. The hospital sent us home with arm restraints because they did not want her rubbing her eyelids while she still wasn’t’ completely aware of what was going on. The surgeon said that the first night was his only concern as once she was fully awake if she rubbed her eyes it wouldn’t feel the best and she would stop. I could not handle putting arm restraints on her so she slept in our bed and I pretty much stayed awake and if she moved I made sure she did not touch her eyes. The morning after surgery was completely different than we expected. We honestly thought she would need a day to rest and recover; this was not the case. She woke up and was ready to play as usual! At the time her little sister was almost one and did not quite understand that she could not hit her sister’s face. We had to apply ointment to Amelia’s incisions 3 times a day and make sure she kept ice packs on her eyes periodically; she was a trooper through it all. After surgery was very simple and Amelia was excited to get extra visitors that brought her favorite lunch, Chick-fil-A. I was a little hesitant about taking her out in public as I was afraid of comments from strangers, etc. A friend took us out for snowballs and this was exactly what we needed. She enjoyed having a snowball and playing outside. Very few people made any comments and if they did, Amelia told them the doctor painted her eyes. As parents, I think it is easy to overthink and worry about all the what-ifs as we want to protect our children. When in reality, our kids keep it simple and keep going. She healed very quickly and had great results with her canthoplasty surgery. It opened her field of vision quite a bit. 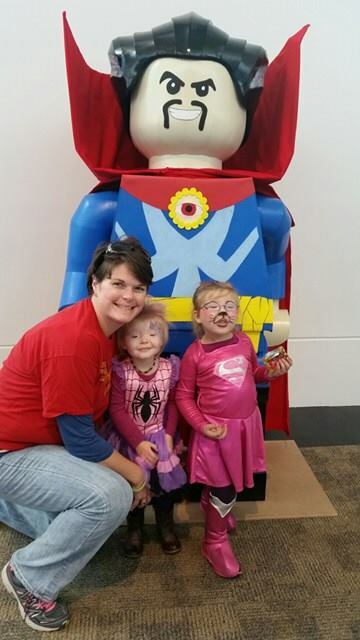 Read part 2 of Cyndy's story of her daughters external levator resection here. Would you like to share your story? Please contact us at contact@bpesfoundation.org.